On Monday (08/04) Indonesia Investments released the March 2019 edition of its monthly research report. The report aims to inform the reader of the key political, economic and social developments that occurred in Indonesia in the month of March 2019 and also touches upon key international developments that impacted on the Indonesian economy. 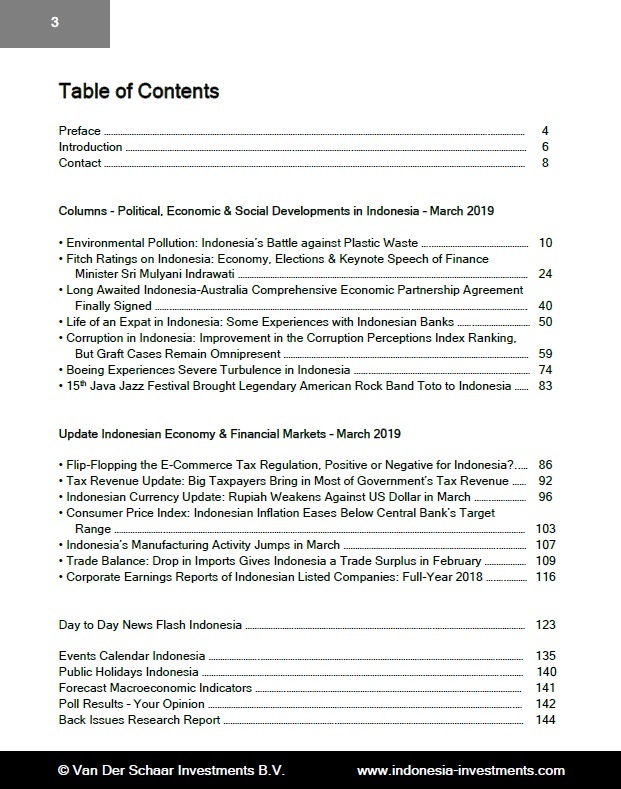 Besides updates on various topics - the performance of the rupiah, the consumer price index (inflation), manufacturing activity and the trade balance - the March 2019 edition also discusses various subjects, including Indonesia's battle against plastic waste, corruption, the Indonesia-Australia Comprehensive Economic Partnership Agreement (IA-CEPA), and the turbulence that is being experienced by Boeing in Indonesia.